Few gestures sabotage even the best intentions of a contemporary artist as quickly and thoroughly as the thoughtless appropriation. Whether engaged lightly, appended fashionably, or invoked at an artist’s convenience, “reference” (quotation, homage, call it what you will) can too often be recognized as “prosthesis,” a plastic stand-in for that which is not being generated by the new work (namely, an idea or critical engagement of equal or greater force than the one appended). Whether an initial ambition constitutes a respectful hat tip, an earnest dialectic, or a wry expedience, a work of art can find itself insufficient to support its borrowed heft, and the strategy can prove as graceful as a crutch, literally stiffing a new work of its potential. Such was my disappointment with the title installation of Ahmet Öğüt’s ‘Exploded City,’ his first solo exhibition in the United States, recently on view at the Berkeley Art Museum. 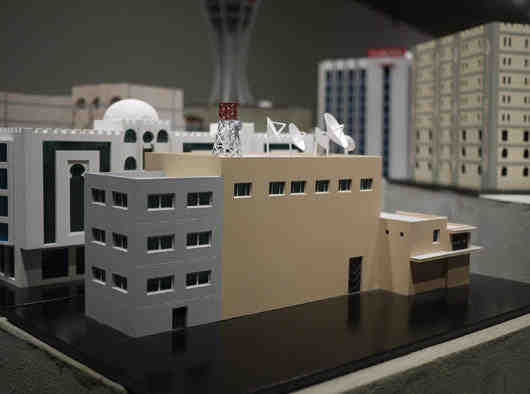 Originally commissioned for the Turkish Pavilion at the 53rd Venice Biennale, it was intended to address a theme of “lapses… that demonstrate how the perception of ‘occurring events’ can vary and lead to differing narrations of history.” Exploded City, the work, was the artist’s vision of a city “from the future,” presented as a scale-model metropolis comprising beautifully rendered replicas of twenty-two buildings and four vehicles from around the world, all past targets of political violence and/or acts of terrorism. These people who don’t speak each other’s language, instead of creating a lingua franca, have learned to communicate through looking into one another’s eyes. This is an interesting idea, and could make for a resonant point regarding the dueling potencies of visual and verbal communication, especially since much has changed since the publication of Invisible Cities in 1972. Mass media has become all the more massive, shaping and contriving both popular and personal memory — and what the tongue fails to communicate across continents, the eye will always try to bridge. 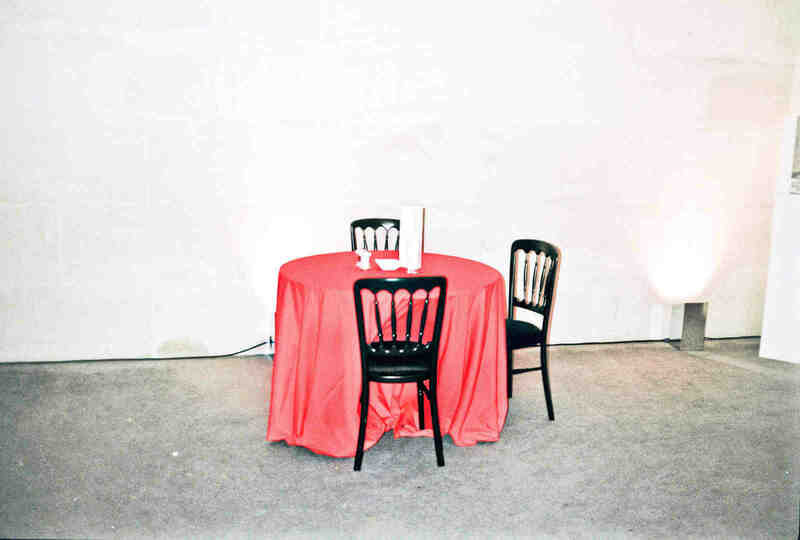 Öğüt addressed this same point in Things We Count (2008), a six-and-a-half minute video that served as the second half of the exhibition. The work consisted of a dolly shot across a field of grounded fighter planes, as a voiceover counted the planes in three languages: English, Kurdish, and Turkish. Whereas the image might have been universally readable, the recitation of numbers disconnected all but a few viewers from a seamless comprehension, and pointed up one of the many shortcomings of language. But if this was even a soft argument that Öğüt intended to make, it ended there. No further elaboration or engagement — on this, or any other point related to Calvino’s text — appeared in either work, and one was disappointed to realize that the artist’s invocation of the author’s novel appeared to have been a protective strategy more than a productive one. ‘Exploded City’ did offer an architectural model of troubling loveliness, with an eerie attention to mathematical exactitude obscuring any trace of humanity. Öğüt included buildings in his city that, in actuality, have not yet been relegated to memory. Some of his buildings are indeed gone (Ferhadija Mosque), but some have been repaired and reopened (Europa Hotel, Madimak Hotel); others have been reconstructed (Mostar Bridge), and still others replaced by memorials (Alfred P. Murrah Federal Building). Were we therefore to understand this installation as a memorial to lost architecture, a critique of our penchant for mourning buildings rather than people? Or did it simply reflect the Google-able world in which we live, one that continuously collapses our maps, blurs the boundaries of now and then, here and there, us and them — though only when we forget to remember what might distinguish the experienced from the mediated, the real from the imagined, the report from the record. One cannot help but lament the light attention paid to these questions, perhaps in the end because the heavier haunting is that of Calvino, who hangs over 'Exploded City’ as a formidable ghost, one which should have been wrestled properly, or simply left to rest.